I love Baltimore. I mean, it’s not the South, it’s not North Carolina, but it’s home (for now). This city stole our hearts while we were in school, and in the years that we’ve been here our love for the charming, quirky, a little bit crazy town has only grown. One of the things that we love the most is the incredible food culture. People here love food. Weird food. Unique food. Food that has Old Bay on it. It seems like every week a new restaurant or food business opens that we’re clamoring to try. And it’s more than just good crab pretzels (though we have that). It’s beer bars with hundreds of beers to choose from, it’s places making mussels with garlic confit and duck fat fries. 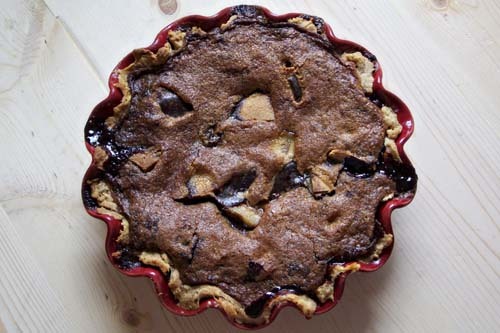 It’s places like Dangerously Delicious, a pie restaurant that features an array of fruit pies, savory pies, and knock-your-socks-off-decadent pies like the Baltimore Bomb. The Baltimore Bomb is a combination of two of my favorite things- Berger cookies and chess. 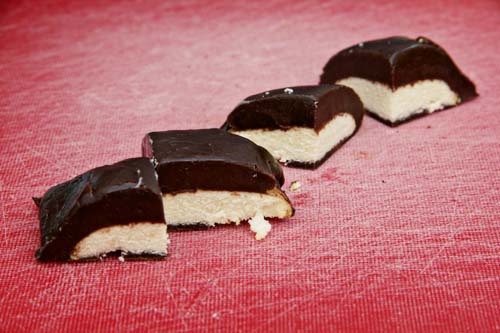 A Berger cookie is quintessentially Baltimore, a cake like cookie topped with a rich ganache. It’s beyond indulgent, so rich that you can only eat one. Or at least, I can only eat one. 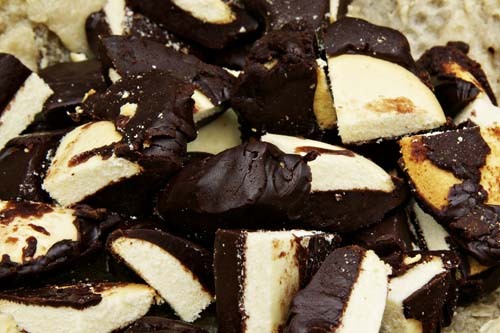 The Baltimore Bomb is chopped up Berger cookies topped with a vanilla chess. 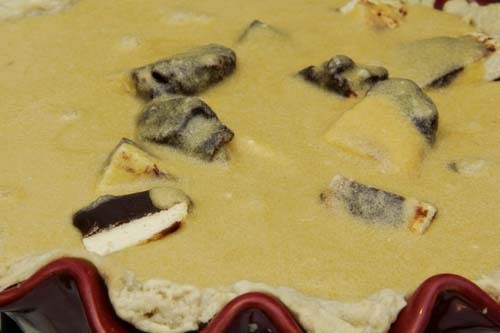 The end result is rich and sweet but also light and incredibly delicious. Or so my guests said, I could only eat a sliver. Thanks, Dangerously Delicious, for bringing this amazing pie into our lives. We need more pie lovers like you in the world. 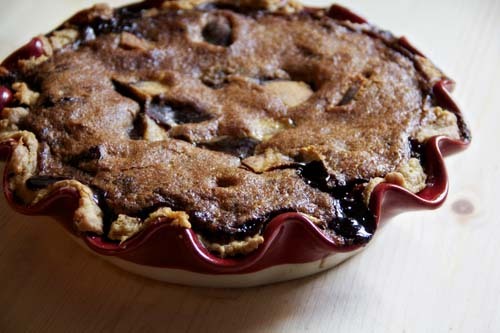 To make your pie crust, combine flour, sugar, and salt. Use your hands to work in shortening. Cube butter and work that in until the texture is like course corn meal. Stir in water until dough comes together. Refrigerate at least one hour. Whisk together sugar, brown sugar, and flour. Beat in eggs, one at a time. Add in butter. Pour over cookies. Cook for 45-60 minutes, or until the top is golden brown and the center is mostly solid. A little jiggle is good, it will quickly firm up. I’ve only been to Baltimore once. It was a delightful place to visit. A place I would return…especially after your views on food from there. Looks amazing! I’ve never heard of anything like it!